This medical drama series features stories of both life and death at Boston’s rundown St. Eligius Hospital. Hospital Administrator Doctor Donald Westphall (Ed Flanders) tries to keep the peace between members of his staff while keeping their egos under control. Surgeon Ben Samuels (David Birney) never stops thinking about women even during the most complicated of procedures. Doctor Mark Craig (William Daniels) can’t help but reminisce about the old days, when health care was something only utilized by those who could afford it. Liver specialist Doctor Daniel Auschlander (Norman Lloyd) is coping with the ironic twist that fate has dealt him — he’s dying of cancer of the very organ that he’s spent his life treating. These experienced physicians must also teach the new generation of white coats. 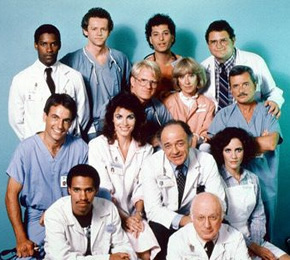 Among them are apprentice surgeon Doctor Victor Ehrlich (Ed Begley, Jr.), nice guy Doctor Jack Morrison (David Morse), sharp Doctor Annie Cavanero (Cynthia Sikes), serious Doctor Philip Chandler (Denzel Washington), and witty bachelor Doctor Wayne Fiscus (Howie Mandel). Nurses Helen Rosenthal (Christina Pickels), Lucy Papandrao (Jennifer Savidge) and Shirley Daniels (Ellen Bry) are there to assist the doctors with patients who have no where else to go but Elsewhere. Performers include: Ed Flanders, William Daniels, David Birney, Ed Begley, Jr., David Morse, Cynthia Sikes, Howie Mandel, Barbara Whinnery, Terence Knox, G.W. Bailey, Christina Pickles, Denzel Washington, Kavi Raz, Kim Miyori, Norman Lloyd, Ellen Bry, Eric Laneuville, Mark Harmon, Paul Sand, Stephen Furst, Jennifer Savidge, Sagan Lewis, Byron Stewart, Judith Hansen, Brian Tochi, Saundra Sharp, Alfre Woodard, Bruce Greenwood, France Nuyen, Cindy Pickett, Ronny Cox, Nancy Stafford, Bonnie Bartlett, Alan Oppenheimer, Florence Halop, George Deloy, Deborah May, Herb Edelman, Patricia Wettig, Helen Hunt, and Chad Allen.